Ah, so the battle for cheap touchscreen phones continues. We already have the Samsung Genio Touch, Samsung Tocco Lite, LG Cookie, and if you add a few more ££ there's the Nokia 5530 and the LG Pop. The Nokia 5230 is Nokia's latest addition to the cheap touchscreen phone market. Let's see how it holds up to the competition. 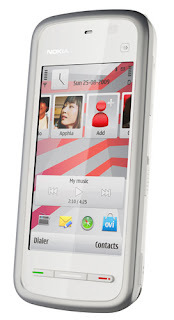 The Nokia 5230 pretty much took its design cues from Nokia's first all touchscreen phone: the Nokia 5800. This phone has a 3.2 inch resistive touchscreen and a 3.5mm headset jack on top which is really a nice addition considering it's not even an XpressMusic handset. 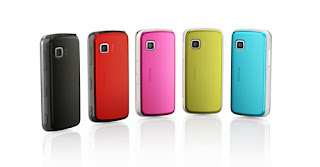 Like the Samsung Genio Touch, the Nokia 5230 offers a colorful back cover, an improvement to the basic black on the Nokia 5800. Although the 5230 and the 5800 pretty much looks the same, on paper, the Nokia 5230 is a bit heavier and the reason for that? Only Nokia knows. The packaging of the Nokia 5230 is really nice. There are two included interchangeable back covers and each back covers comes with their own stylus. Aside from the included stylus, the Nokia 5230 also comes with a plectrum like the Nokia 5800. The 5230's homescreen features a Contacts bar for easy access to your contacts. The bottom is the shortcut bar and the middle is reserve when the music player is playing in the background. The Nokia 5230 now has kinetic scrolling which means you can flick through lists like on the iPhone, however, it's not really implemented on the entire UI. There are instances wherein you still need to press on that scroll bar. Responsiveness is really good and in fact, probably much better than the first generation 5800 I've seen. Messaging reminds me of the Samsung i8910 HD (since both phones runs Symbian OS). In portrait mode, you get the basic alphanumeric keypad but when you rotate it to landscape mode, you get the full QWERTY keypad. Setting up an email account is pretty easy and if you have gmail, yahoo, hotmail or other major email providers, it's as easy as putting in your username and password. The FM radio is still present, the music player is actually pretty good and supports MP3/WMA/WAV/RA/AAC/M4A audio files. Audio quality through the headset is pretty decent, however the speaker quality needs improvement. The browser isn't something to brag about especially if you're only getting EDGE connection but you can probably do better if you download Opera for Symbian. The Nokia 5230 is in fact only a 3G phone without WiFi. Nokia reserved the WiFi for the midrange Nokia 5530. HOWEVER, and this is still unconfirmed, the Purple Edition that Vodafone is displaying on their website seems to have WiFi as what Vodafone puts in the specifications page. Someone has called up Vodafone and someone said that the Purple Edition, which is probably exclusive to Vodafone, touts WiFi. As for the camera, the 5230 only has 2 megapixel camera. Video recording is okay if you're only going to upload to YouTube and the picture quality is decent when shooting landscape photos in broad daylight but indoor shots is pretty lousy. Nokia seems to be gearing the Nokia 5230 as the Samsung Genio's main competitor but the Genio is being offered by the major carriers under Pay As You Go and it seems Vodafone only has the 5230 for free under a £15 a month tariff. It's a cheap tariff but it's still £15 for 24 months. But if Pay as You Go or Pay Monthly doesn't really matter and you really want a good touchscreen phone, the Nokia 5230 offers some pretty good features. For one thing, 3G means faster internet connection for emails, streaming vidoes, and web browsing which the Genio lacks but right now, the Genio is still the cheapest and would fit the budget of parents wanting to give their tweeners a mobile phone or those who're looking for their first touchscreen phones but on a tight budget. Yes, the Genio doesn't have 3G but EDGE will suffice for checking quick emails or your friend's Facebook status. 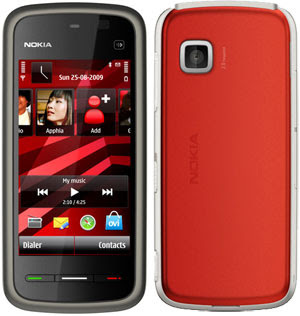 However, the three major carriers isn't your only source for contract mobile phones and some mobile phone retailers such as Carphone Warehouse, dial-a-phone, mobiles.co.uk, etc may offer the Nokia 5230 unlocked or on Pay as You Go so in that case, the Nokia 5230 offers the better features. Hmm, how come GSMArena says it doesn't have a stylus? No mention that it has GPS and Ovi Maps with free navigation!!! It has A-GPS, meaning you need to connect to a network. I haven't tried the Ovi Maps for the 5230 because back then it wasn't free. Now Nokia is offering a free Ovi Map with the 5230. Check the Ovi store. It does have A-GPS but it can work also work unassisted by network. Check out the manual to see how you can disable A-GPS. Here is a sample video of my 5230's GPS in action. Having gps, how readable is the screen outdoors? I want 2 buy a nokia phone....which 1 shld I go 4???? 5235 or 5230 or 5233???? ?